MY HUSBAND THRILLS in talking about the coyotes at Chimney Butte School. You have to admit that just the name of the rural North Dakota school, which Randy attended for 14 months in the 1960s, draws you in to listen. His tale is short. One day Randy and his classmates couldn’t go outside for recess because of coyotes in the schoolyard. That’s it. Yet, the story deserves telling. How many men in their early 50s attended a country school? Furthermore, how many of those students encountered coyotes on a school day? Preserving such memories is important. So is preserving the actual school building. Last Sunday I stepped inside a one-room Minnesota country school that has been restored and transformed into a museum. That’s nothing new, really. Old schoolhouses have also become township halls, private residences and businesses, although some have been abandoned and simply fallen into heaps of rotting wood. 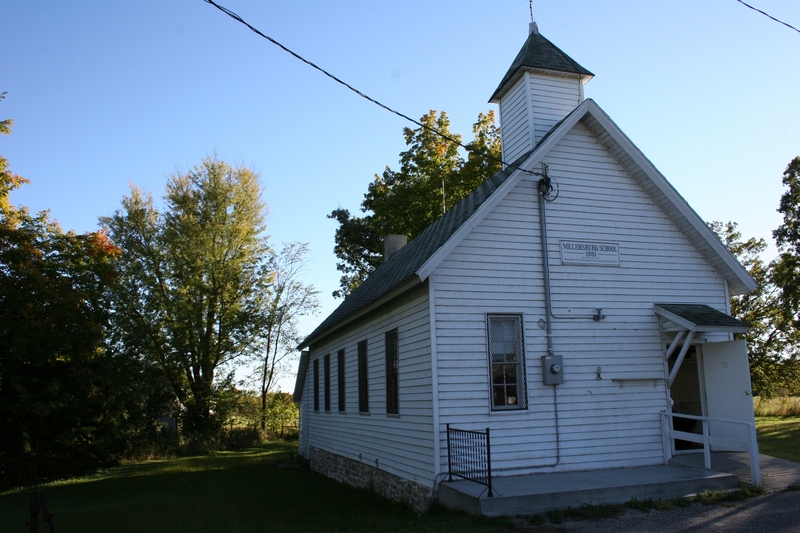 Members of The Christdala Preservation Association are assuring that doesn’t happen to the District 20 Millersburg School in rural Rice County. 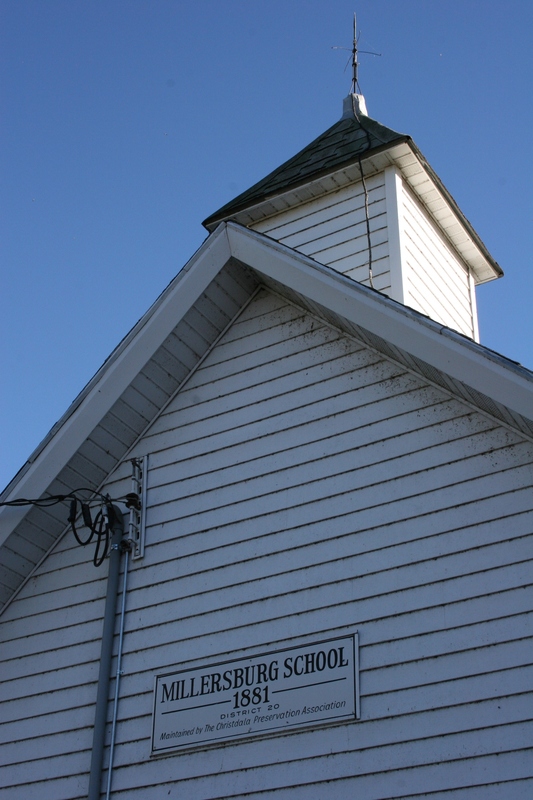 The association has acquired the former schoolhouse and is transitioning it into a museum for the Millersburg community. The 1881 Millersburg School is now a museum. The old country school sits across the road from Boonie's restaurant and bar along Rice County Road 1. Inside I discovered records and artifacts from the school and nearby Christdala Evangelical Swedish Lutheran Church, historic photos, an old buggy, military memorabilia and more. Mostly, though, I appreciated the care taken to restore the building. 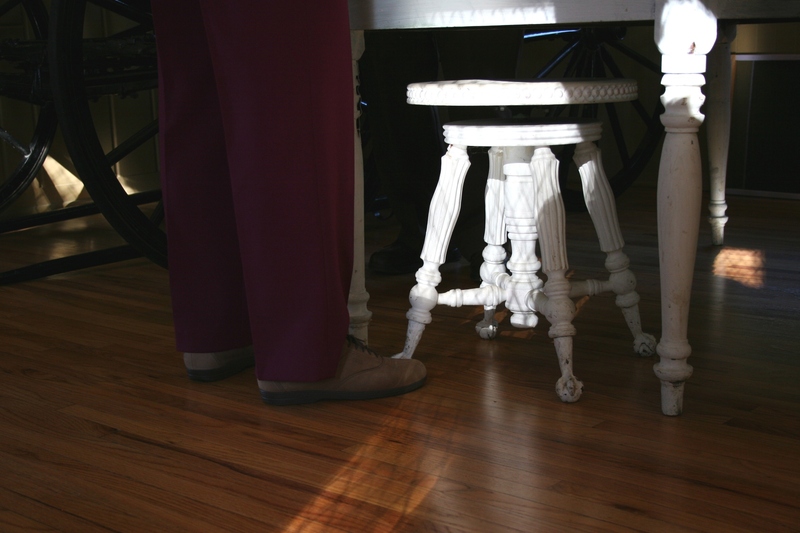 Gleaming wood floors made me want to push back the tables and chairs and host a square dance. These preservationists paid attention to detail, right down to the American flag and portrait of George Washington. As this museum evolves, I expect, hope, that the preservation association will open the doors on a regular basis to the public. And I expect, hope, that those who gather there will exchange stories about their days in a country school, coyotes or not. 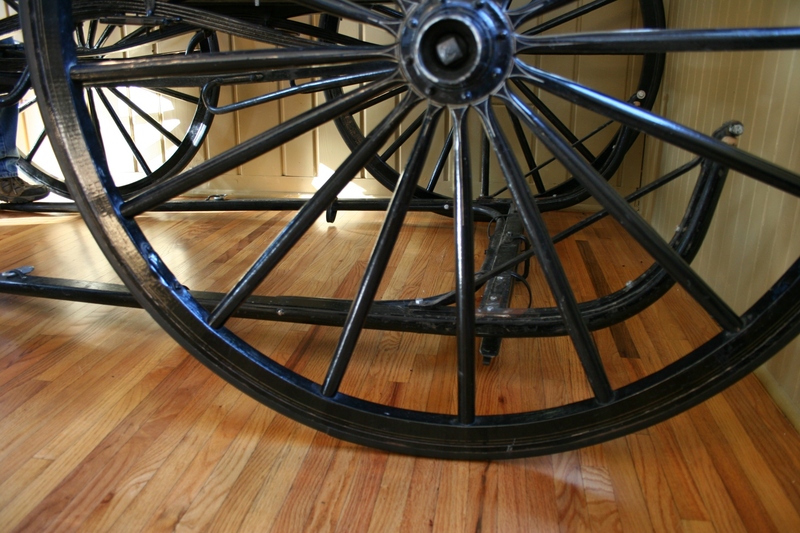 The refurbished wood floor shines under the wheels of an 1887 Michigan Buggy Company buggy which was taken apart and reassembled inside the schoolhouse museum. 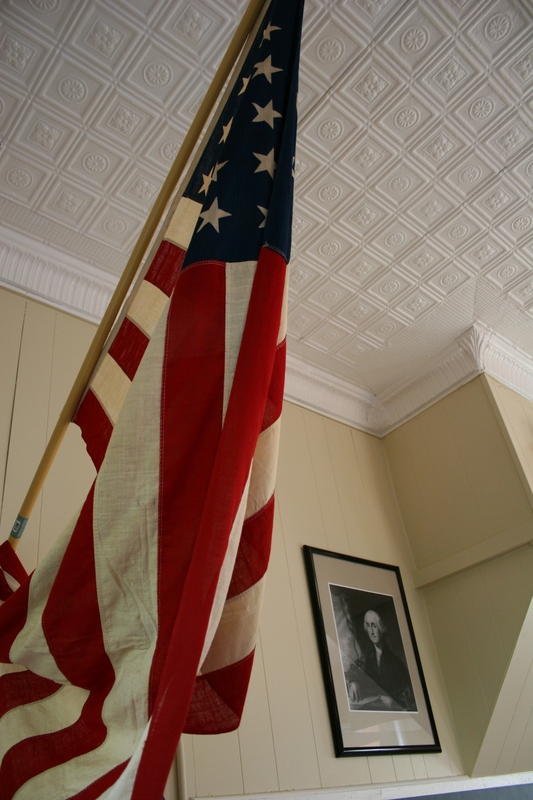 At the front of the schoolroom hangs the American flag and a Presidential portrait below the period ceiling. 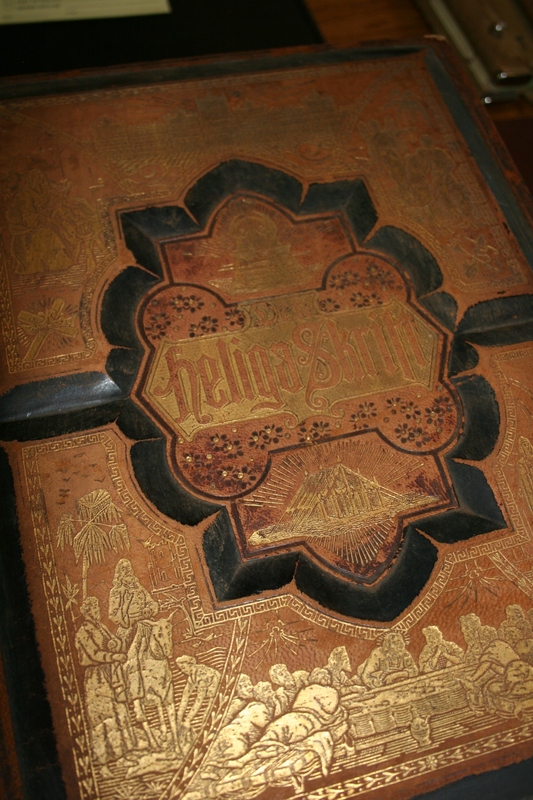 The 1889 Swedish bible used in worship services at Christdala Evangelical Swedish Lutheran Church, located just down the road from the school. 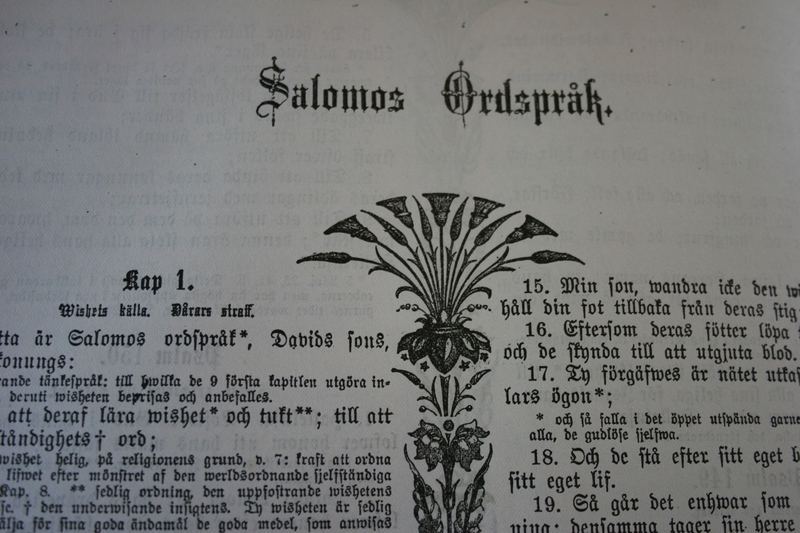 A page from the 1889 Swedish bible. 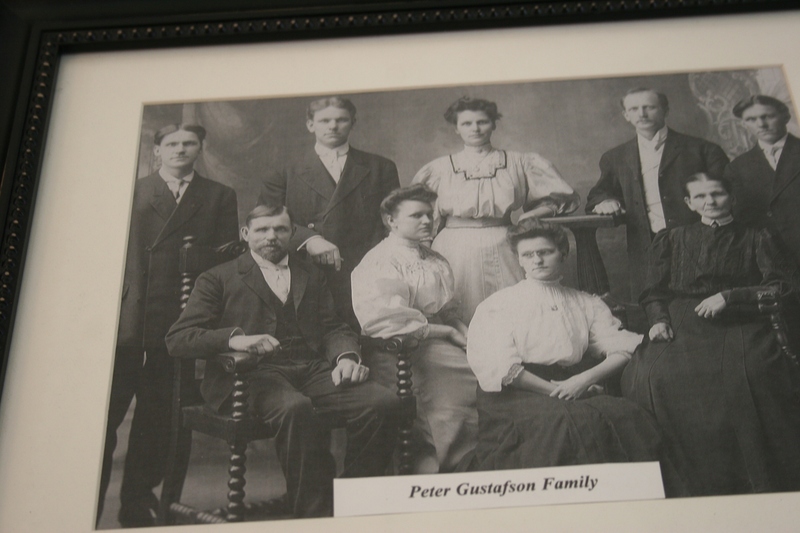 Among the museum photos is this portrait of the Peter Gustafson family. Peter was among the founding members of Christdala. He was also the brother of Nicolaus Gustafson who was murdered by outlaw Cole Younger during an attempted 1876 bank raid in nearby Northfield. 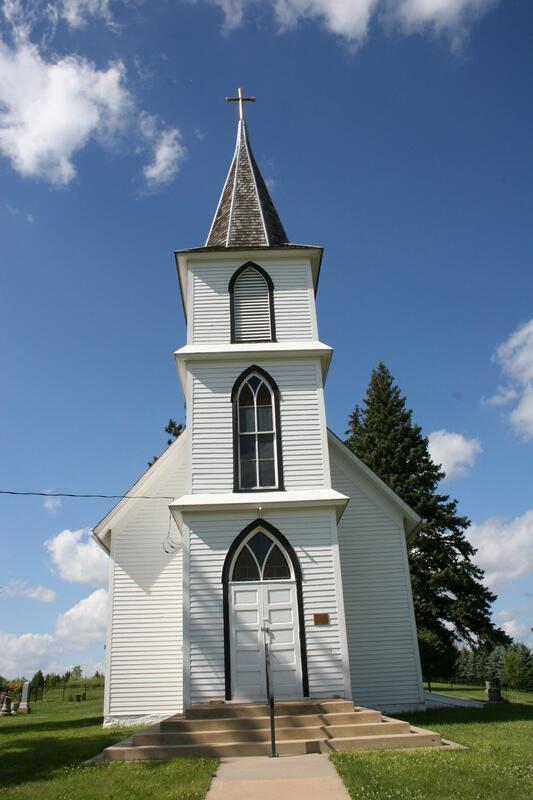 At the time of Nicolaus' death, the Millersburg Swedish community had no church or cemetery. Nicolaus' untimely death prompted the Swedes to form Christdala. Peter Gustafson's 18-year-old twin son, Eugene, died tragically in March 1905 when a log rolled forward on a wagon and crushed him. This information is published in The History of the Christdala Evangelical Swedish Lutheran Church of Millersburg, Minnesota, written by B. Wayne Quist. 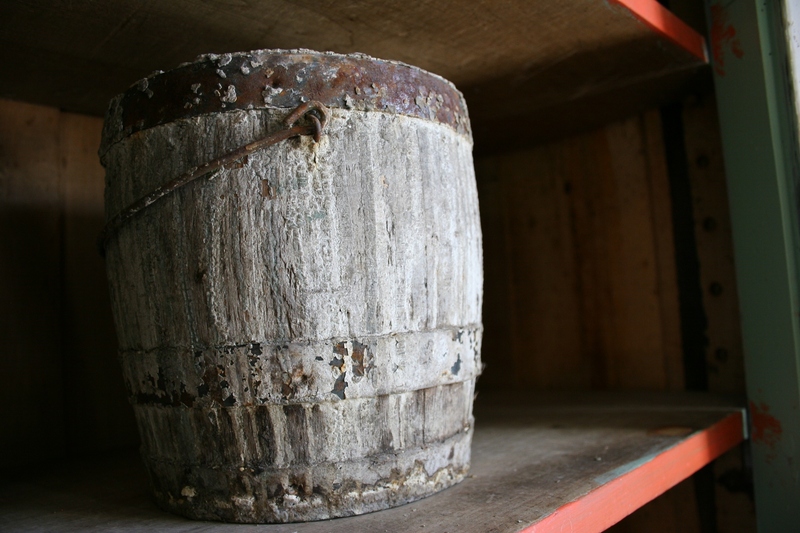 An old wooden pail rests inside a simple cupboard in a corner of the schoolhouse. I spied this old piano stool tucked under a table. A museum visitor pulled the stool out and suggested perhaps naughty students sat on it in a corner. Of all the historic photos I viewed in the museum, this one is my favorite. It's clear the boys really don't want to be there, with their mom's arms draped around them. But she appears to be a strong, determined woman. 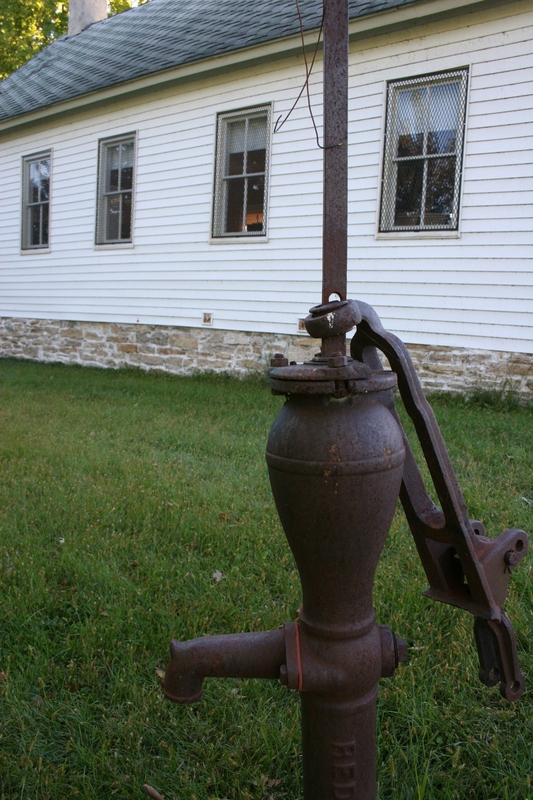 How many stories could this old water pump, next to the school, tell? 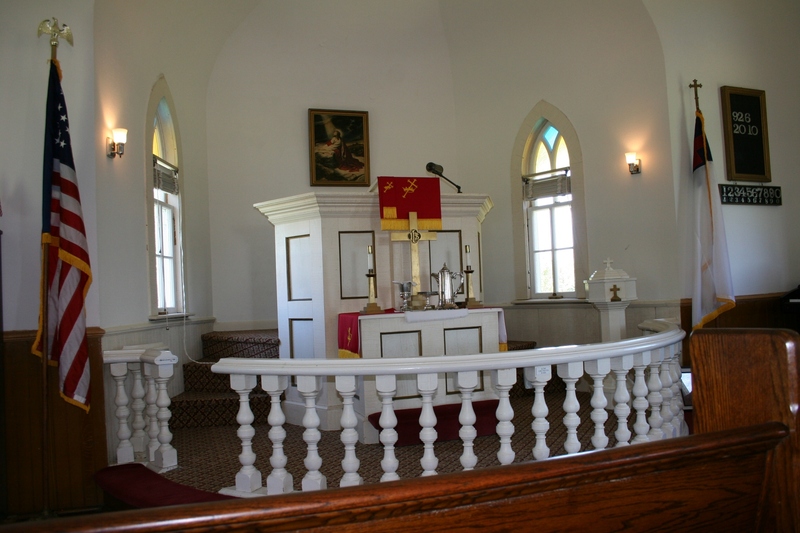 Christdala's 1880 altar and pulpit join at the front of the Swedish Lutheran church. THEY COULD NOT HAVE KNOWN, but a hymn they/someone chose for the annual church celebration happened to be my favorite. And so I sang, in verse two of fair meadows. Verse three, of bright the sparkling stars on high. And the final verse—glory and honor, praise, adoration. Only occasionally did I glimpse at the service program, at the words I’d memorized in childhood, sung decades later at my wedding. Beautiful Savior. Everything about Sunday afternoon at Christdala Evangelical Swedish Lutheran Church in rural Millersburg was beautiful. Sunshine. The pure, clear voice of the soloist singing of saints gathering at the beautiful river. The wisps of steam rising from a percolating coffee pot that I glimpsed through a church window while sitting in a front pew. Art on the lawn by my friend Rhody Yule. 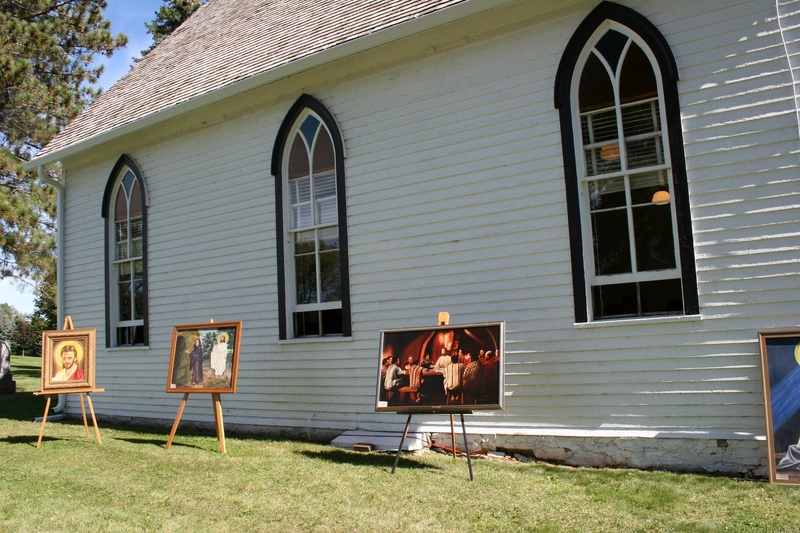 On this September day, descendants of the Gustafsons and other Swedish immigrants who founded this church in 1877 gathered to celebrate their heritage and the 1878 Gothic Revival style wood-frame church that has been preserved. The clunk of wood as worshipers settled into pews. Bread dipped into wine. Bowed heads and box elder bugs. And outside, on the lawn, ham sandwiches and lefse and cake in a lunch spread out on tables, in an open stretch of grass between gravestones. Hugs exchanged. Here, atop a hill, they gathered—friends and family—to worship, to honor the Swedish immigrants who established this congregation, Christdala, Christ’s Valley. 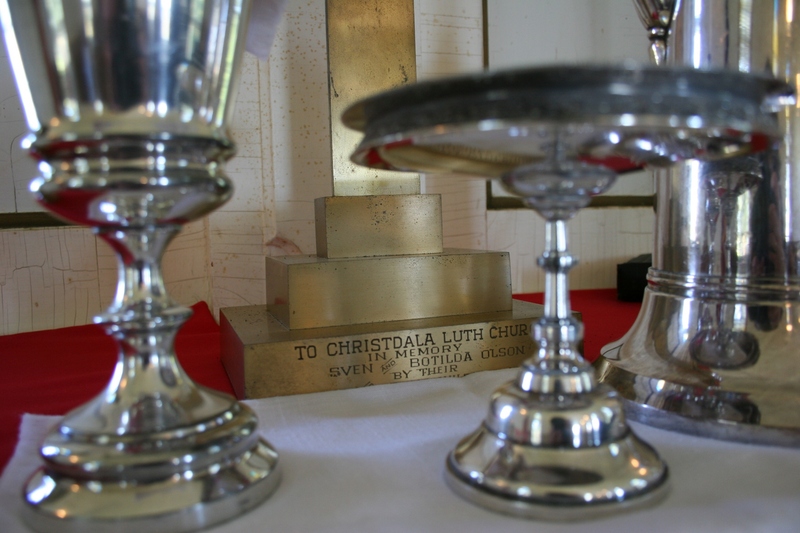 Communion ware at Christdala and a memorial inscription on the altar cross. 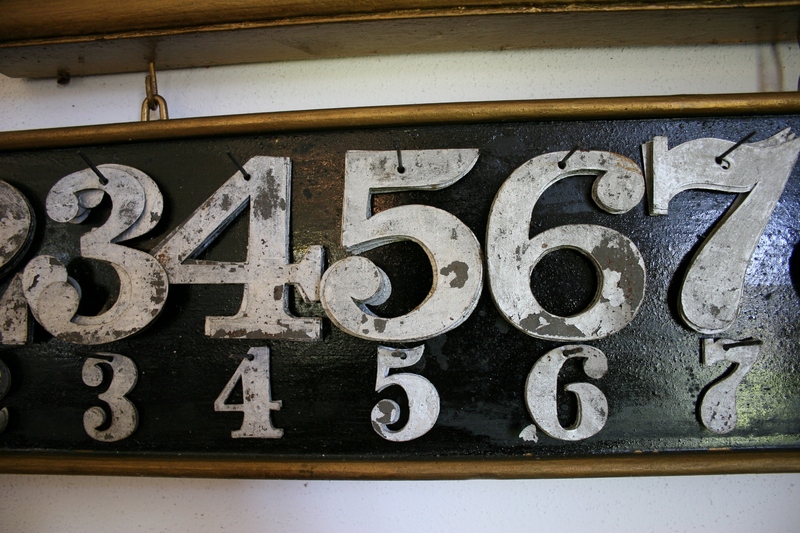 Numbers on the hymn board mark the celebration date, September 26, 2010. 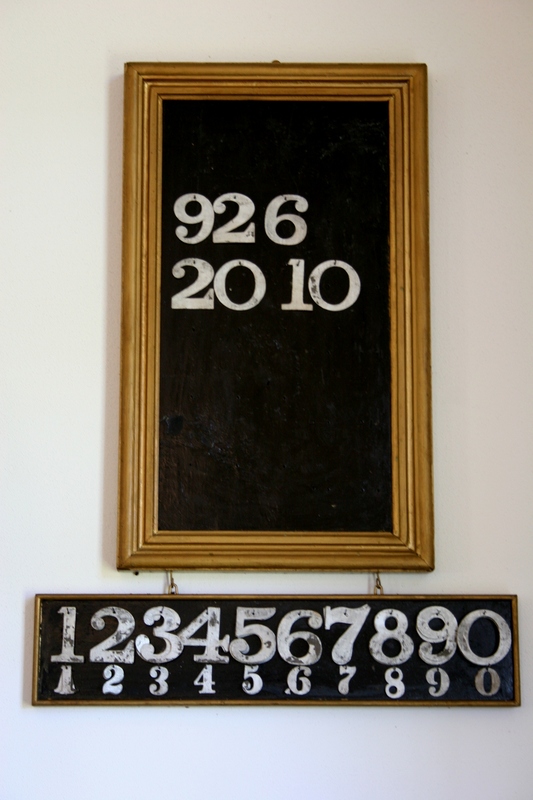 Hymn board numbers are worn from years of use, reflecting the long history of this church. 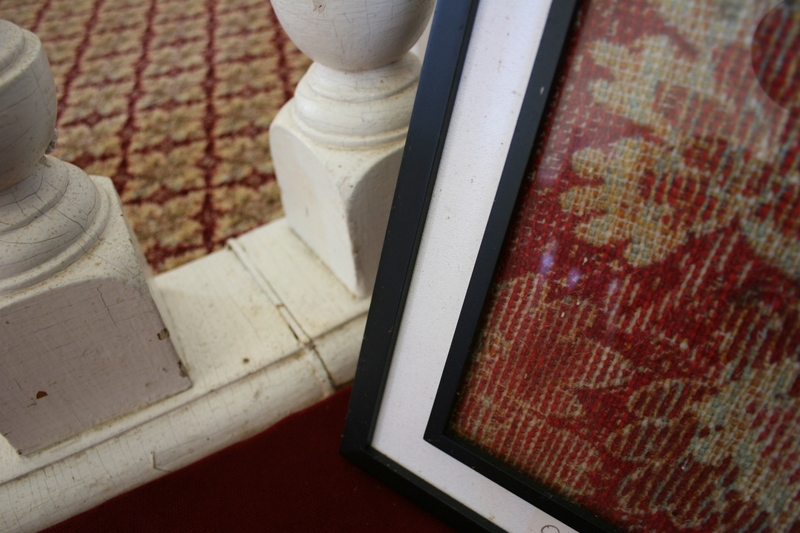 Restoration and preservation of Christdala was detailed, right down to matching the replacement carpet, left in photo, to the original framed carpet sample at the right. 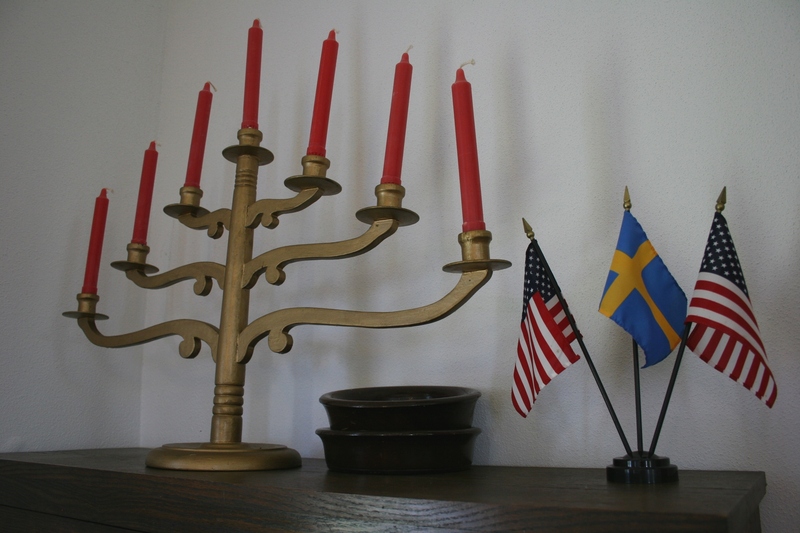 Reminders of the Swedish heritage rest atop a cupboard in a corner of the sanctuary. 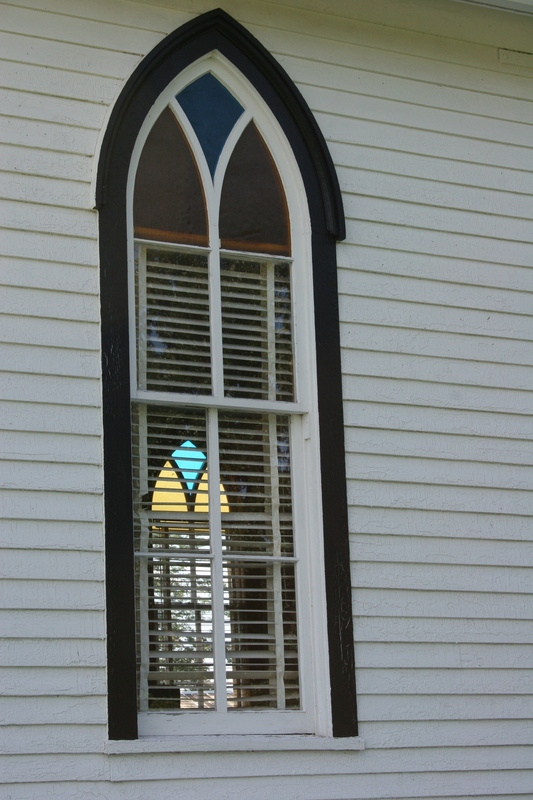 All of the windows in Christdala are tipped in blue and yellow, the colors of the Swedish flag. 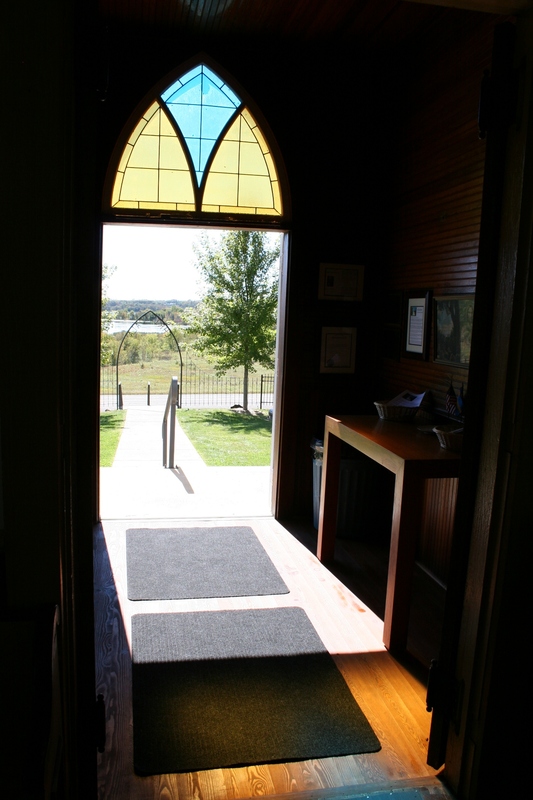 This shows the front door opening south to an archway that frames the valley below. 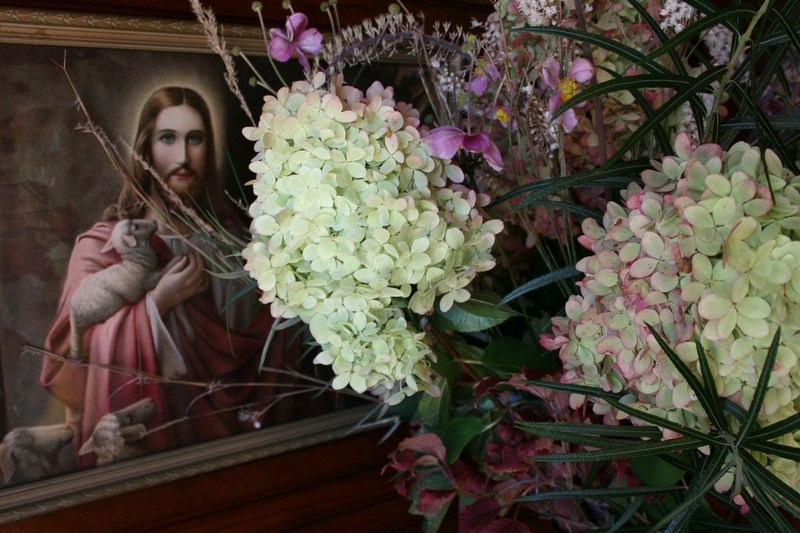 Inside the entry of Christdala, fresh fall flowers sit next to a print of Christ, the Good Shepherd. 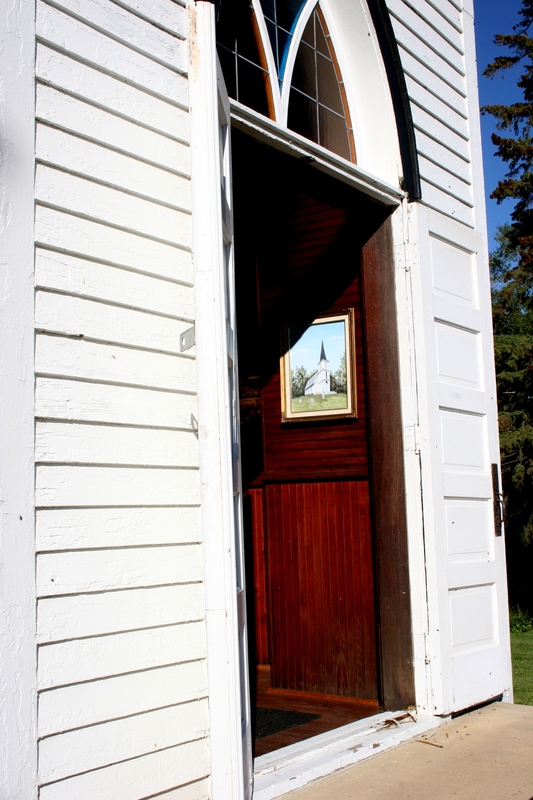 The front doors of Christdala open to reveal a painting of the church hanging inside the entry. Christdala Swedish Lutheran Church sits atop a hill along Rice County Road 1 west of Millersburg. The historic Christdala Evangelical Swedish Lutheran Church. INSIDE THE SMALL country church, I place my hand atop his, the coolness of his skin seeping into the warmth of my fingers. I feel the slight tremble of his hand, a hand that for some seven decades lifted brush to canvas and metal and wood as he painted. He is cold, even though dressed in layers. I am warm in my short-sleeved shirt. We wait—me in the stiff-backed pew and him in a folding chair. In just a few minutes, I will introduce my 92-year-old artist friend to a sanctuary full of worshipers, briefing them on his life as a painter. But how do you condense seven decades of painting into 180 seconds? I do, because I don’t enjoy public speaking and I have time constraints. He is Rhody Yule, a former sign painter by day. And by night he painted to express himself in hundreds of portraits, landscapes, still-lifes and religious scenes created through the decades. 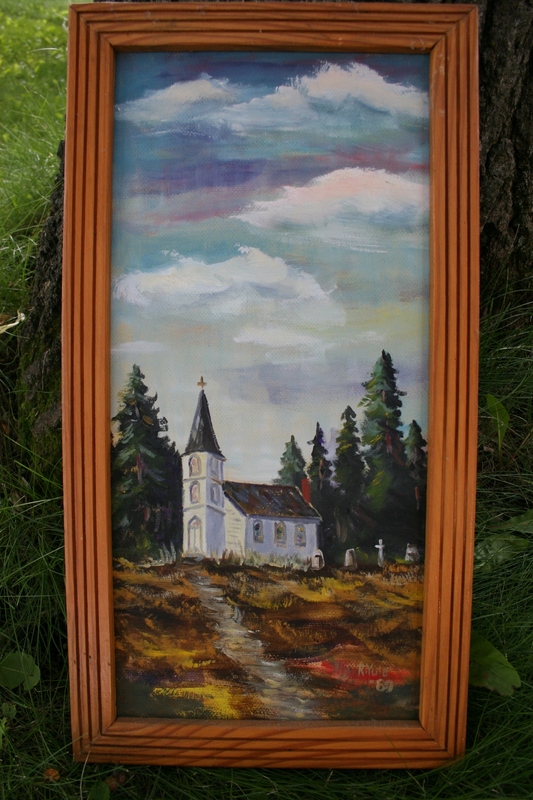 On this Sunday afternoon we have come by invitation of the Christdala Church Preservation and Cemetery Association of rural Millersburg to showcase nine of Rhody’s religious paintings, including one of Christdala Evangelical Swedish Lutheran Church which he painted in 1969. This is his debut public art showing and I am thrilled at the opportunity for Rhody, first the subject of a magazine feature article I wrote and now, I am honored to say, my friend. A humble man of faith, who on more than one occasion has claimed that his paintings “ain’t nothin’” or “aren’t much,” deserves this public display of his art. So on this perfect Sunday afternoon in September, when the sun filters through leaves tipped in red and golden hues, my husband and I have come to this hilltop site to set his paintings upon easels against the backdrop of the 1878 wood frame church. 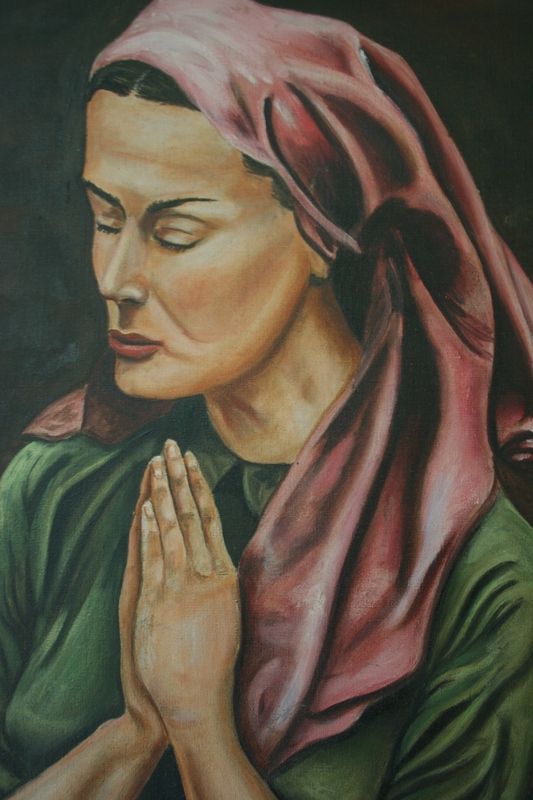 A woman in reverent prayer. 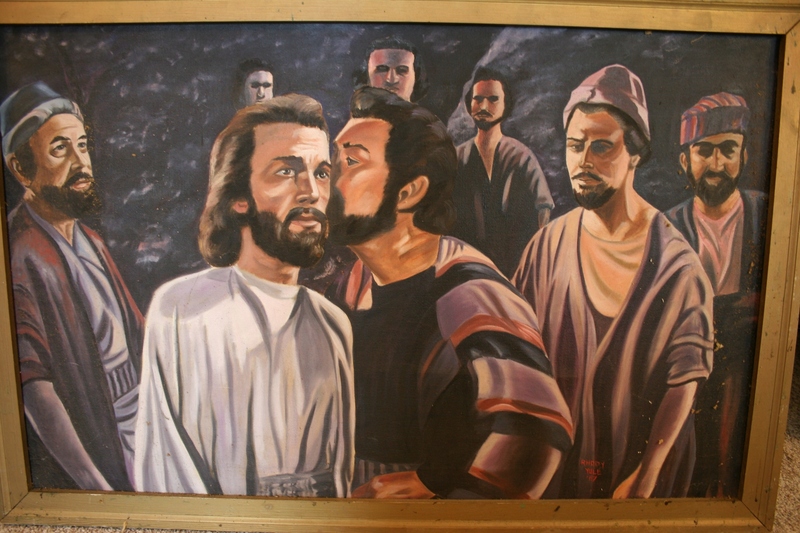 Judas betraying Jesus. The Last Supper. The simple lines of the church provide an ideal backdrop for Rhody's paintings. 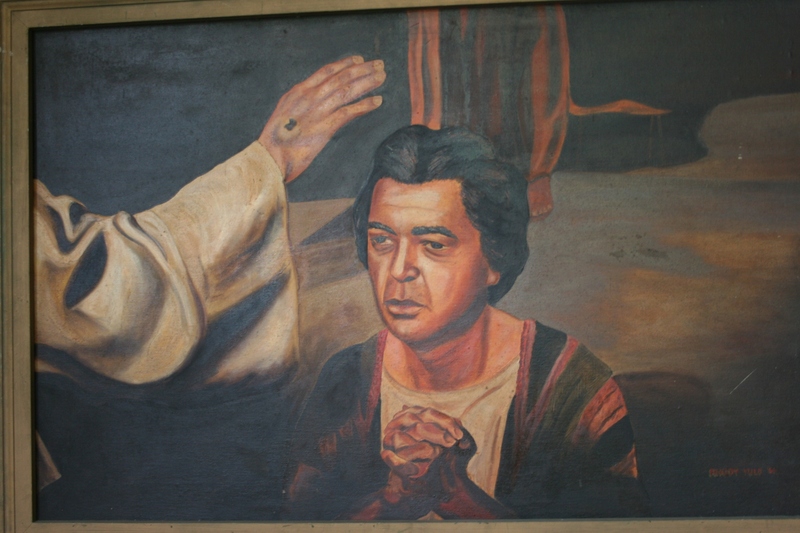 Rhody's depiction of Judas betraying Jesus is among the paintings displayed. "Our Glorious Savior," "The Empty Tomb" and "The Last Supper" on exhibit. Jesus appears to, and blesses, doubting Thomas in Rhody's painting. Rhody calls his painting of the suffering Christ, "Misery." 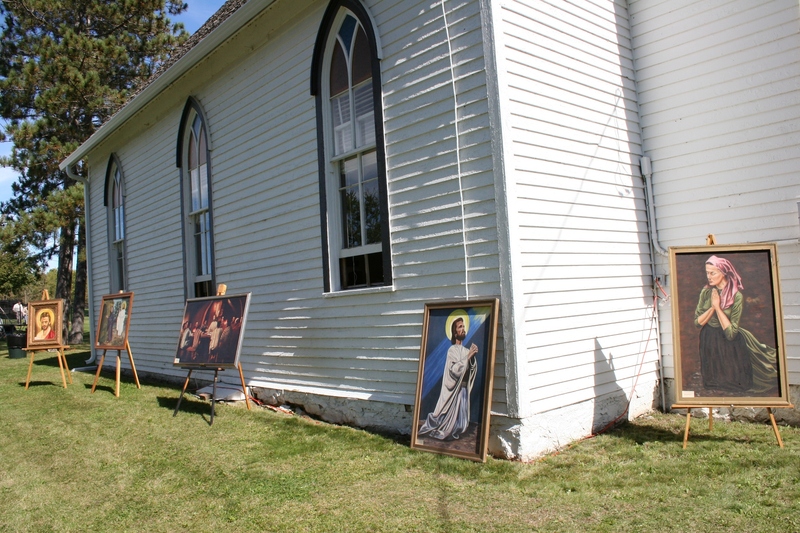 Here in the churchyard, on a strip of grass between the church and the gravestones of Swedish immigrants, those who have come for Christdala’s annual worship service/open house peruse the nine religious paintings, chat with Rhody, chat with me. They share their admiration for his art. I am smiling. This is as it should be. Praise for the artist, the slight wisp of a man who, since age 16, has quietly sketched and drawn and painted for the joy of creating. 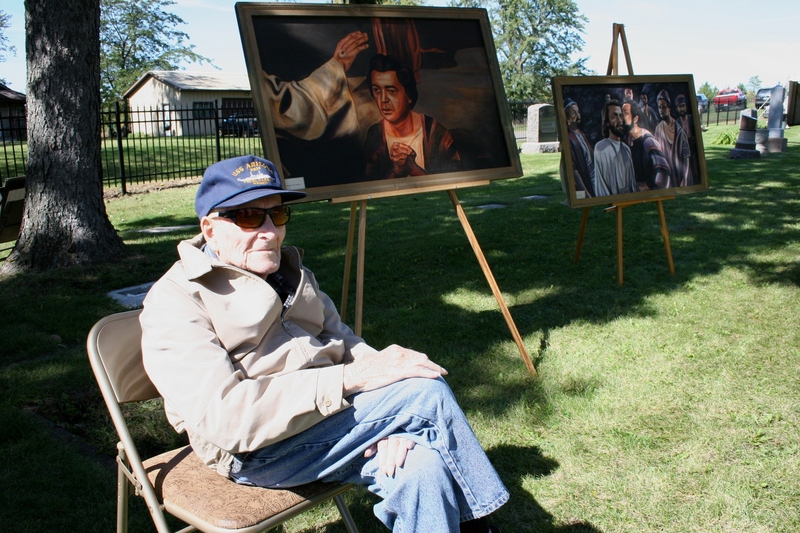 Artist Rhody Yule sits next to some of his paintings displayed at Christdala. As the afternoon gathering draws to a close, Rhody gives his Christdala painting to the preservation society. I am unaware that he planned to do this. “It belongs here,” he tells me later. That is so Rhody, to quietly, without a big to-do, present his Christdala painting to those who will most appreciate it. Rhody's 1969 painting of Christdala church. THANK YOU to B. Wayne Quist for inviting Rhody and me to participate in Christdala’s annual open house. I am especially grateful for this opportunity to display Rhody’s art for the first time ever. He has also been accepted for a solo art show January 14 – February 26, 2011, in the Carlander Gallery at the Paradise Center for the Arts in Faribault. PLEASE CHECK BACK for posts about historic Christdala, which closed in 1966. 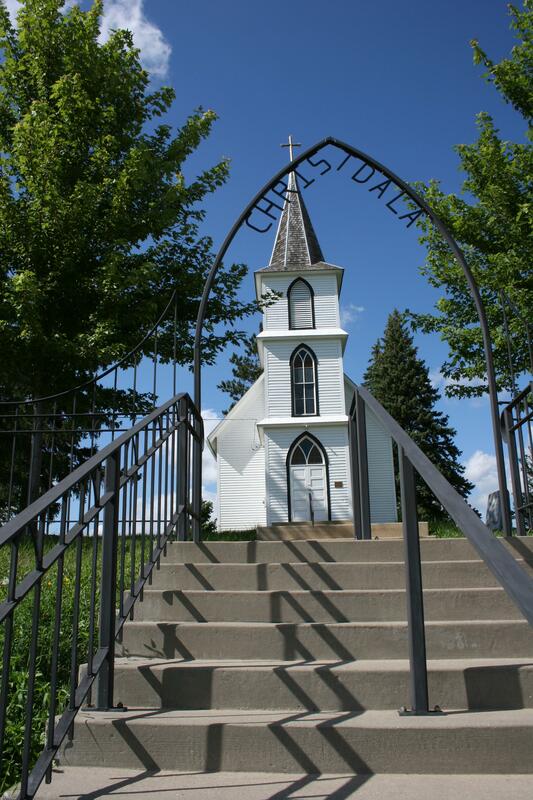 Steps lead from Rice County Road 1 to Christdala Swedish Lutheran Church. I DOUBT ANY OTHER MINNESOTA church can claim roots in a notorious attempted bank robbery. But Christdala Evangelical Swedish Lutheran Church of rural Millersburg can. The long-dissolved congregation traces its origins back to the September 7, 1876, attempted robbery of the First National Bank in nearby Northfield. During that failed crime, Nicolaus Gustafson, a Swedish immigrant from Millersburg, was shot point blank in the head by outlaw Cole Younger. He died four days later and was buried in Northfield because the Millersburg Swedish community didn’t have a graveyard, or a church. The evening of the bank robbery, the Swedish immigrants met to talk about constructing a church and soon thereafter built Christdala. 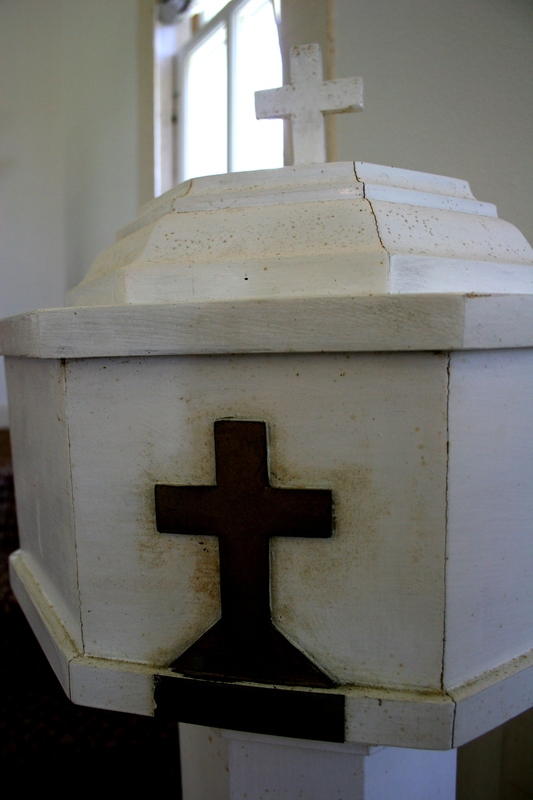 This Sunday, September 26, the Christdala Church Preservation and Cemetery Association will open the doors to this historic church which sits high atop a hill overlooking Circle Lake just west of Millersburg along Rice County Road 1. On this roadway that passes by the 1878 country church, the James-Younger Gang fled after the botched Northfield raid. 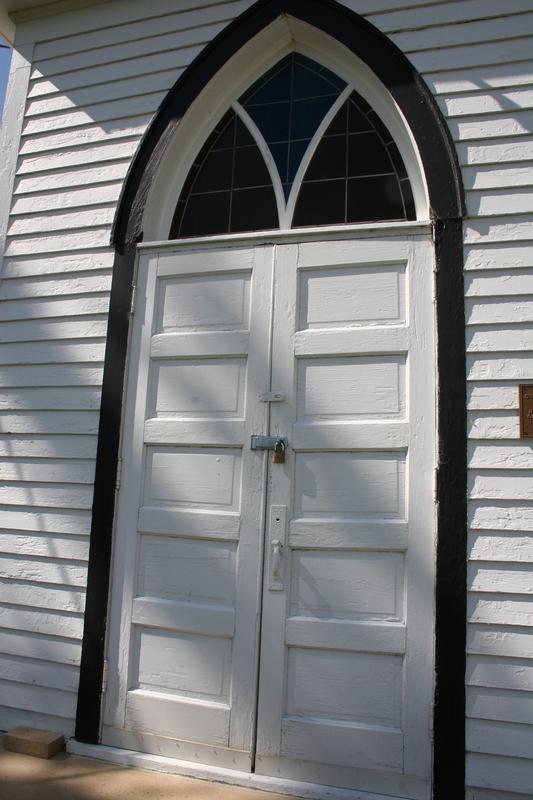 The doors to Christdala, which is on the National Register of Historic Places. I’ll be there Sunday for the 2 p.m. fall worship service led by the Rev. Ralph Baumgartner, pastor of Galilee Evangelical Lutheran Church in Roseville, who has family ties to Christdala. I’m anxious to get inside this sanctuary, which I’ve only viewed through the slats of Venetian blinds while photographing the locked building on a Sunday afternoon in July. I've only peered through the blinds into the sanctuary. This Sunday I’ll arrive well before worshipers and the curious and the families with a connection to Christdala. I’ll arrive with a van full of paintings by my 92-year-old artist friend, Rhody Yule of Faribault. Rhody, who has been creating art for 76 years, did an oil painting of the church in 1969. He’s showing that piece and eight other religious-themed works at Christdala’s open house. He’ll talk a bit. I’ll talk a bit. But mostly, we welcome visitors to pause and study the paintings, to feel the emotions painted into the faces of the disciples, of Christ, of a woman in reverent prayer. Rhody paints with a heart of faith reflected in his art. Christdala Swedish Lutheran Church painted in 1969 by Rhody Yule. 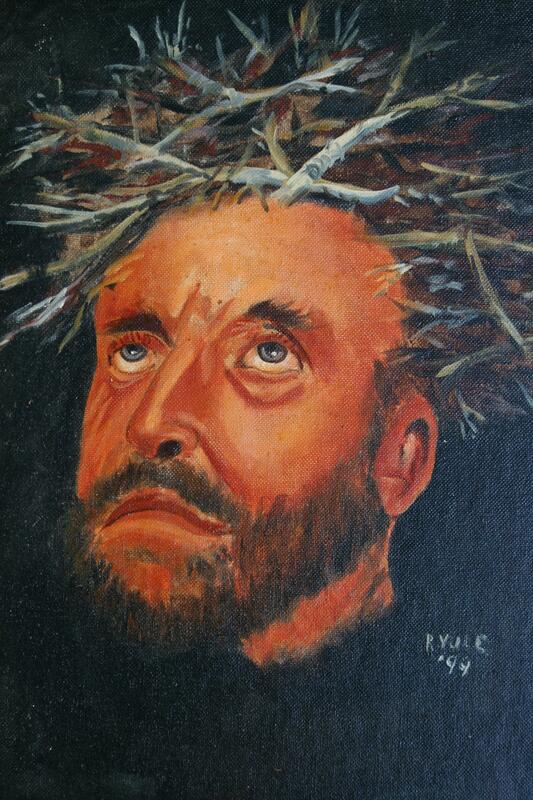 A snippet of Rhody Yule's painting, one of nine he will show at Christdala. 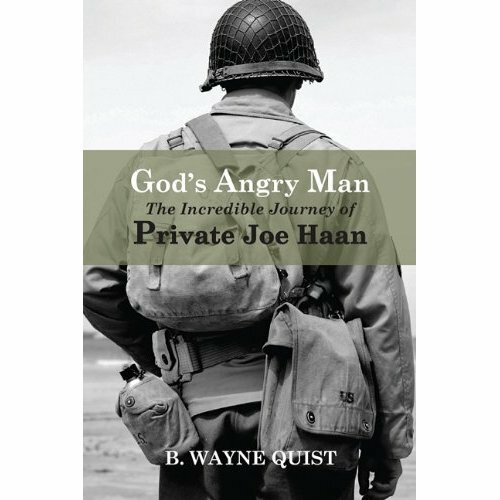 Christdala visitors can also pick up a copy of God’s Angry Man—The Incredible Journey of Private Joe Haan by B.Wayne Quist. The newly-released book tells the true, powerful life story of Haan (Quist’s uncle), who grew up in an Owatonna orphanage and who served in Patton’s Third Army during WW II. Quist, a member of the Christdala Preservation Association, will donate profits from Sunday’s book sales to Christdala. Copies of the fall issue of Minnesota Moments magazine, featuring my photo essay on country churches, will also be on sale with a portion of the proceeds benefiting the church. B. Wayne Quist will sell copies of his latest book, God's Angry Man. 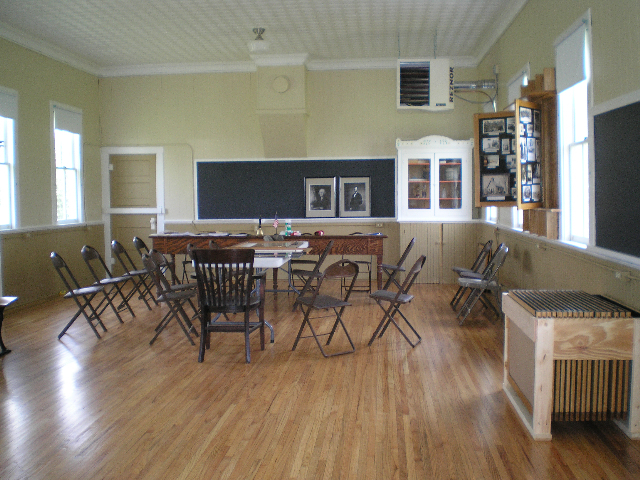 Before and after the worship service, visitors can tour the 1881 Millersburg School, which the Christdala preservation group has refurbished and is transitioning into a community museum. Exhibits include church and school records, photos, military medals and records, Indian artifacts, an old doctor’s buggy and more. Faribault genealogist and preservation member John Dalby will be at the schoolhouse to answer questions. 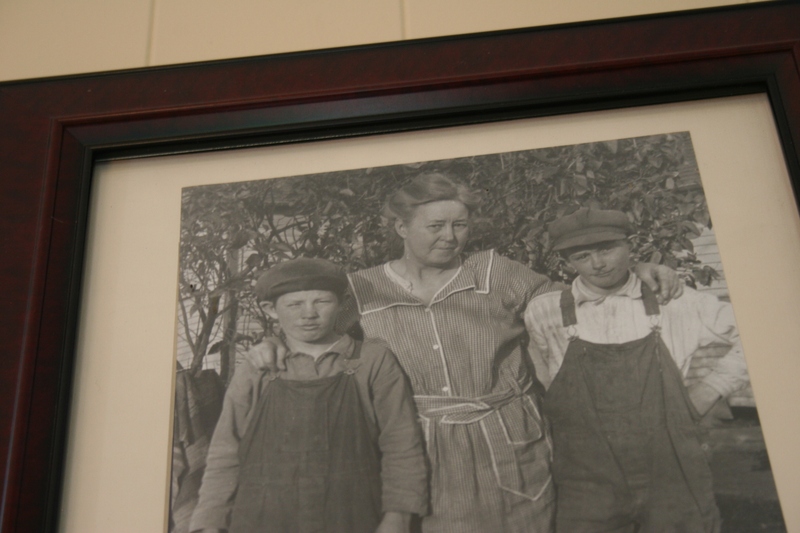 The Millersburg School has been refurbished and will feature exhibits tied to local history. Sunday promises to be an interesting day for those who gather at Christdala. It will be a day of history and of art, of worship, of thoughtful remembrances at gravesites, of families reuniting and of others simply coming together on this spot, this Christdala, this “Christ’s Valley,” here where the outlaws once escaped on their galloping horses. 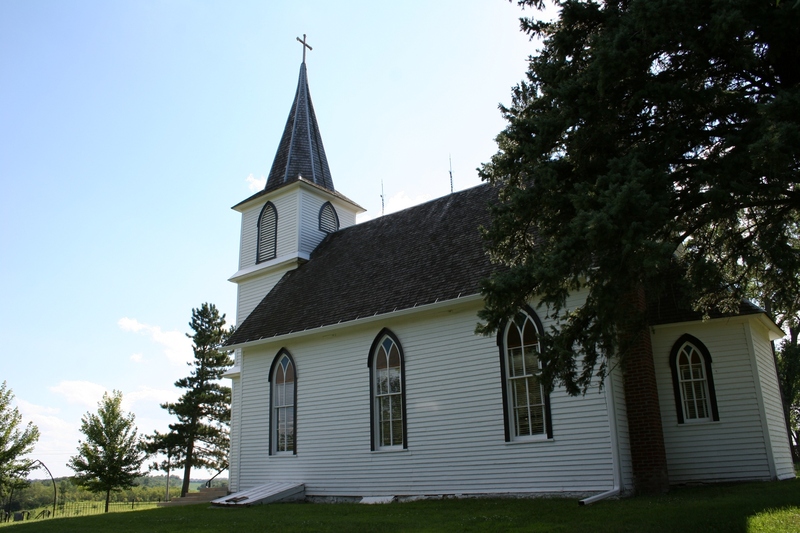 A side view of the 1878 Christdala Swedish Lutheran Church. Book cover image courtesy of B. Wayne Quist and schoolhouse image courtesy of John Dalby.